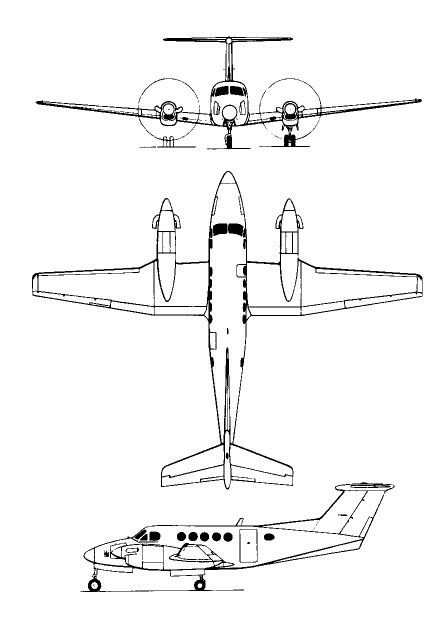 A development of the King Air 90/100, the prototype King Air 200 flew on 27 October 1972. With bigger engines, a bigger wing, more fuel capacity and more useful load, the B200 came along in 1980 with even more efficient Pratt & Whitney PT6A42 engines and another increase in load. The T-tail Super King Air, with its two 850-shp Pratt & Whitney engines, can be operated from smaller airports; takeoff and landing over a 50-foot obstacle can be accomplished in 2579 and 2845 respectively, without prop reversing. First deliveries of Super King Airs were made in early 1974, and the better capability of this aircraft resulted in the company receiving contracts for the supply and support of 34 examples modified for service with the US Army. These are powered by 559kW PT6A-38 turboprop engines, and were allocated the designation C-12A subsequent military orders for the C-12A have to date included 27 and 30 for the US Army and USAF respectively. Other service variants are the UC-12B (66 ordered) for the US Navy/Marine Corps, powered by 634kW PT6A-41 turboprops; the C-12C (14) for the US Army with PT6A-41 engines; the generally similar C-12D (27) for the US Army, but with an added cargo door; and the special-mission RU-21J (three) bristling externally with antennae and equipped for the requirements of the US Army's 'Cefly Lancer' programme. More recent variants are the RC-12D 'Guardrail V' electronic reconnaissance platform, C-12E upgraded transport for the USAF, C-12F transport for USAF and UC-12F for the Navy, RC-12H reconnaissance variant and UC-12M utility transport. The USAF purchased 40 twin-turboprop Super King Air I 200Cs as C-l2Fs to meet part of its Operational Support Aircraft requirement following an initial period of lease. The cargo door developed for the US Army's C-12D has been available as an option for civil production since 1979, and in April 1981 Beech introduced a new version, identified as the Super King Air B200. It differs by having PT6A-42 turboprop engines which offer improved cruising performance. A little known but important part of Beech's product line is the company's special-mission range of aircraft-standard models factory-modified and certified for aerial survey, photography, specialized training and other unusual purposes. One aircraft developed is a Super King Air with tip tanks, several of which are being built for the French Institut Geographique National for long-range photo flights. The tip tanks add about an hour to the KA's endurance. Other military versions of the King Air series I include the C/UC/RC-12, RU-12, and T-44 for the US forces, together with maritime surveillance variants produced for export customers, for which search radar, low-light TV, Flir, and acoustic processing equipment are optional. In 1995, Raytheon rolled out its 1,500th King Air 200, complete with an EFIS avionics panel. King Air B200 version for commuter airlines. Accommodates up to 13 passengers with an optional belly luggage pack. Engines: 2 x P&W PT6A-42, 850 shp. Maximum ramp weight: 12,590 lbs. Maximum takeoff weight: 12,500 lbs. Standard empty weight: 7538 lbs. Maximum useful load: 5052 lbs. Maximum landing weight: 12,500 lbs. Maximum usable fuel: 3645 lbs. Best rate of climb: 2450 fpm. Max pressurisation differential: 6.5 psi. 8000 ft cabin alt @: 29,742 ft. Maximum single-engine rate of climb: 740 fpm @ 122 kts. Single-engine climb gradient: 364 ft/nm. Normal cruise @ 27,000 ft: 279 kts. Fuel flow @ normal cruise: 563 pph. Stalling speed clean: 99 kts. Stalling speed gear/flaps down: 75 kts. Engines two 850-shp Pratt & Whitney reverse flow, free turbines. Initial climb rate 2450 fpm. Takeoff distance (50’) 2579 ft. Landing distance (50’) 2074 ft.
Std useful load: 5,052 lbs. Initial ROC: 730 m / min. T/O run (to 15m): 1005 m.
Ldg run (from 15m): 790 m.
Gross weight: 14,200 lb (6 441 kg).